If I showed you two photos from the start and end of this day in the Lake District, you probably wouldn't believe me. Although, it was February in England so unpredictable and extreme weather can hardly be surprising. I was invited by Home of Millican to join them for a walk in their beautiful home of the Lake District; a day for good conversation with an all too lovely bunch of new friends and to shoot the newly designed Fraser the Rucksack alongside the bag's namesake, Rob Fraser, his wife, Harriet and their cheeky pup, Guilly. I was also joined by Callum, a straight-talking, down-to-earth Yorkshireman who also takes a fine photograph, lovely Bex from Millican who acted as 'mum' for the day, and photographer, Jim Marsden, who inspired me with his sole use of film as his photography medium. The plan was to set off from somewhere just above Ullswater and head out walking, shooting and talking. Rob and Harriet - who work as a photographer-writer/husband-wife duo - recently completed a two year long project called The Long View. They chose seven trees within the Lake District and created art, poetry, photography and more based around each tree. We decided to walk out to one of those trees, chat about the project and shoot the bags. I loved the concept of the shoot and was keen to join in straight away. Anyone who knows me well, knows I have a slight obsession with trees and the idea of mixing nature with art was something I was curious and excited about. We were awoken to heavy rain early in the morning before convening at a remote carpark, loading up our backpacks with Fellpack lunches and spare layers, and covering up in our waterproofs ready for a rather damp walk up a hill. 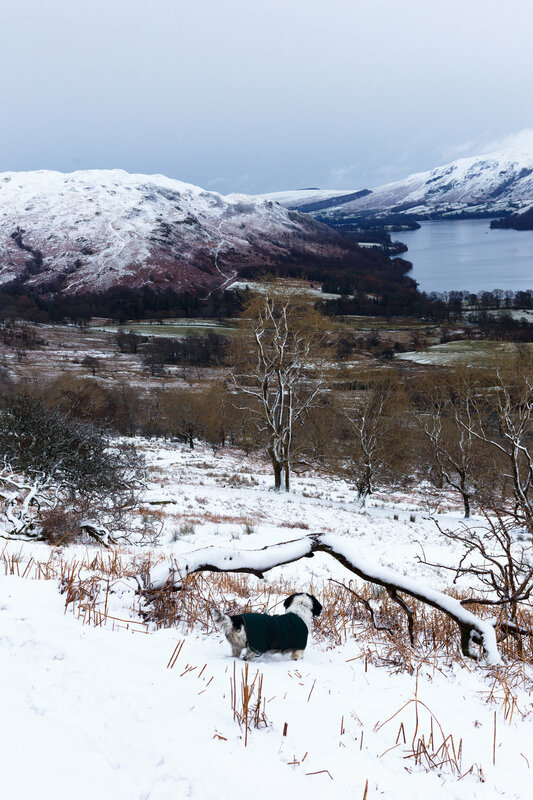 Despite the soggy weather, views looking over Ullswater along the trail were spectacular, as the hills were covered in snow and eerily obscured by mist and clouds. The higher we climbed, the whiter the landscape became until we found ourselves in what can only be described as a snow storm... But the weather didn't matter, in fact it made the reason we were walking up this particular hill all the more significant, especially for Rob and Harriet who were outwardly thrilled by the conditions. We were headed to see one of the trees in Rob and Harriet's project - a Glencoyne Pine standing proudly on a steep slope watching wistfully over Ullswater and the surrounding hills. If a tree could choose where it were to grow, I'd say that this particular pine took a precarious chance and got exceedingly lucky. Yet perhaps this tree is lucky for more than one reason... The Glencoyne Pine is not protected by a forest, but rather it stands alone and exposed yet strong and bold despite the stark and brutal weather conditions, which usually hinder trees from growing this tall, this high up. It is a rather ordinary tree in an extraordinary setting; and on this particular day we saw extraordinary weather conditions which only seemed to elevate its special value as part of nature and the project by Rob and Harriet. Scots Pines aren't usually found alone, and so this isolated tree demanded our whole and undivided attention; we watched silently as its leaves were battered by the frozen wind, in awe of its great height and perfect posture. I thought that perhaps this was the luckiest tree in the world to be so confident, so alive and with such a breathtaking view to look out on. The tallest pine in the valley. I was sad to leave it, though by that point my fingers were all but frozen and heading down out of the storm was necessary for us mere humans. We left the tree alone, to battle Mother Nature's forces bravely. 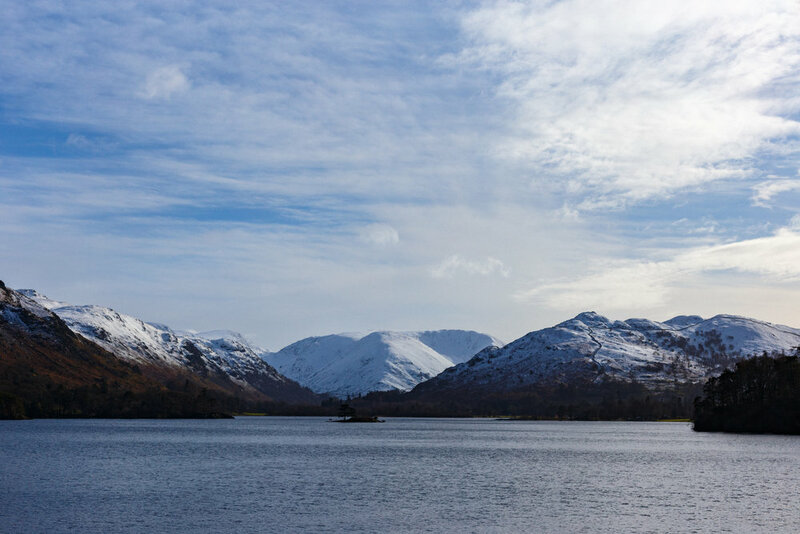 As we descended, the weather cleared and the snowcapped fells above Ullswater appeared strikingly beautiful and eerily calm. 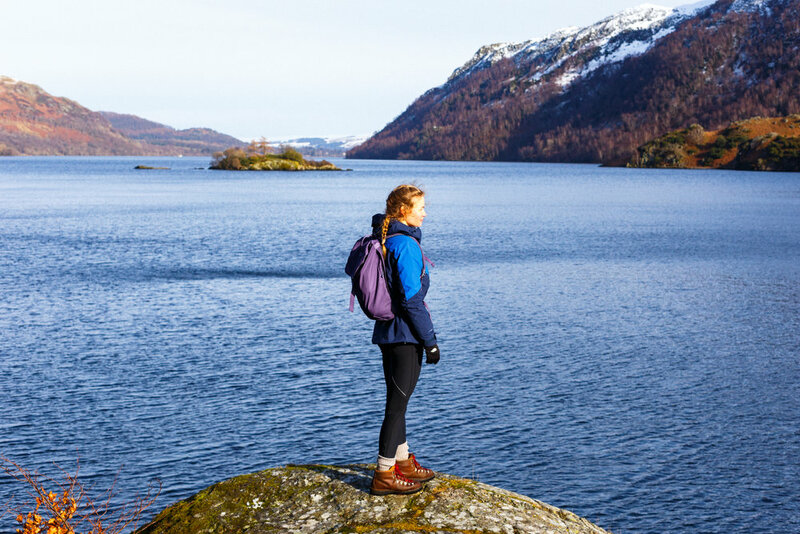 Everything was covered in snow, from our eyelashes to our brightly coloured Millican Rucksacks; the Fraser, re-designed with some new features and colours. My particular favourite was the purple Heather pack, though the blue Tarn looked beautiful amongst the snow. The air was biting and my toes were numb from the cold, but I think we were all just happy to be out and about amongst the snowy forests and Lakeland views. I could have stayed up in the hills for a long time that day. Somehow, quite unbelievably, when we got back to the cars the sun had come out, so we whizzed along the lake-front to a secluded 'beach' on the banks of Ullswater; eating our lunch and enjoying the clear and breathtaking view before us. I could hardly believe that just an hour before we were caught in a snowstorm at the top of the hill, just over my shoulder. Now the sun was beating down and the lake sparkled beneath it. It was a glorious afternoon that contrasted so starkly to the wintery white-out we had experienced that morning. While we enjoyed the sunshine, I knew we appreciated it even more for having battled the elements just a few hours before. I thought of the pine; wondering what the view was like from where he was stood, wondering how many days like this one he had seen in his time, wondering how many people had stopped to even think about that pine. Rob and Harriet's project invites us to think about what trees mean to us, how we are affected by being around them, and how they change through the seasons. The pair have visited their seven chosen trees multiple times, in multiple conditions; each time documenting their thoughts and feelings through photography and words. It has, indeed, made me think about what trees mean to me.They are a place to hide or a place of solstice; they signify wilderness and therefore happiness. I have a great love for trees and the way they make me feel, often denoting a particular tree with a particular moment or period in my life - the lemon tree in my garden in Australia when I was 7, the tall redwoods with the most delicious scent that I remember from travelling in America, the ivy that clung to my grandpa's house, and my most recent memory of the vast blue pine forests framed by snowy peaks when trekking in Nepal. What do trees mean to you? I'd love to know if you have a memory with any particular tree! Comment below. Check out Millican's new Fraser Rucksacks here. Read more about Rob and Harriet's project, The Long View, and their thoughts on the Glencoyne Pine.